Visitors walk on Tiananmen Square in Beijing, May 29, 2014. Authorities in the Chinese capital have poured hundreds of thousands of security personnel into the Beijing municipality ahead of next week's 25th anniversary of the June 4 military crackdown on the 1989 student movement, official media reported on Friday. Security posts have been set up at 192 major intersections encircling the capital, while passengers on subway trains and other public transport are being subjected to "airport-style" security checks, the official Beijing Youth Daily and Beijing Morning Post reported. Some 100,000 intelligence operatives have been dispatched across the city to pose as curbside shoe-cleaners, news vendors and ticket sellers under counter-terrorism measures announced in the wake of last week's deadly attacks on a crowded market in the troubled northwestern city of Urumqi. Meanwhile, the authorities have recruited some 850,000 volunteers to conduct daily security patrols of Beijing's streets, in conjunction with security operations carried out by the city's police and the People's Armed Police, the papers said. According to the reports, "no upper budget limit" has been set for the operation, which comes amid growing calls for a public reappraisal of the 1989 crackdown, which put a bloody end to weeks of mass protest calling for greater democracy and the rule of law on Tiananmen Square. Shanxi-based independent writer Du Guangda said the authorities were deliberately seeking to create a tense atmosphere ahead of next week's anniversary. "They want ... to scare off anyone who is thinking about taking part in a June 4 event," he said, adding that the authorities were particularly keen to prevent a commemorative action begun by Beijing-based rights activist Hu Jia from taking off. "They don't want them to take part in 'Return to Tiananmen'," Du said. But he said the biggest threat to social order isn't from China's rights activists and dissidents, vocal as they may be. "We have had several terrorist incidents in a short space of time, so China is very focused on anti-terrorism operations now," he said. The ruling Chinese Communist Party under President Xi Jinping has already met to discuss ways to counter "extremists" in Xinjiang in the wake of the May 22 explosions in the regional capital Urumqi, which killed 31 people and injured 90. Du said many acts of public violence aren't linked to ethnic conflict in Xinjiang, however. "The main factor behind the growing number of terrorist incidents is huge social injustice and conflict between the government and the people, as well as the intensification of ethnic conflicts," he said. "These show that the Communist Party lacks the ability to govern." The government has also moved to detain around 50 dissidents, rights activists and lawyers in the run-up to the anniversary, rights activists said. The 25th anniversary is believed to be particularly significant for those who see the decision by late supreme leader Deng Xiaoping to send in the troops as a turning point in Chinese history, when a more conciliatory approach espoused by reform-minded then-premier Zhao Ziyang might have led the country down a more democratic path. "The tension is heightened this year compared with previous years," Zha Jianguo, a Beijing-based member of the banned opposition China Democracy Party (CDP), told RFA. "The measures taken against dissidents and rights defenders is worse than during the era of [former security chief] Zhou Yongkang." "The authorities have already been in touch for several 'chats,' and they will take me to Shanghai on June 1, and we won't come back until after June 4," Zha said. But he said the anti-terrorism measures were largely a show of force. "If there really was a terrorist attack, they still wouldn't be able to prevent it," he said. Earlier this week, police in the central province of Henan swooped on a group of activists in the provincial capital Zhengzhou, detaining them on May 26 in connection with a memorial for Zhao Ziyang and late former premier Hu Yaobang they attended in February, the overseas-based Chinese Human Rights Defenders (CHRD) said in an emailed statement. A spontaneous mass memorial for Hu at the traditional grave-sweeping festival on April 5, 1989 had triggered later mass student rallies in Tiananmen Square. Zhao was later removed from office and held under house arrest for the rest of his life for seeking dialogue between student leaders and party officials. Four of the Henan activists arrested this week remain behind bars under criminal detention, while others remain in police custody, CHRD said. 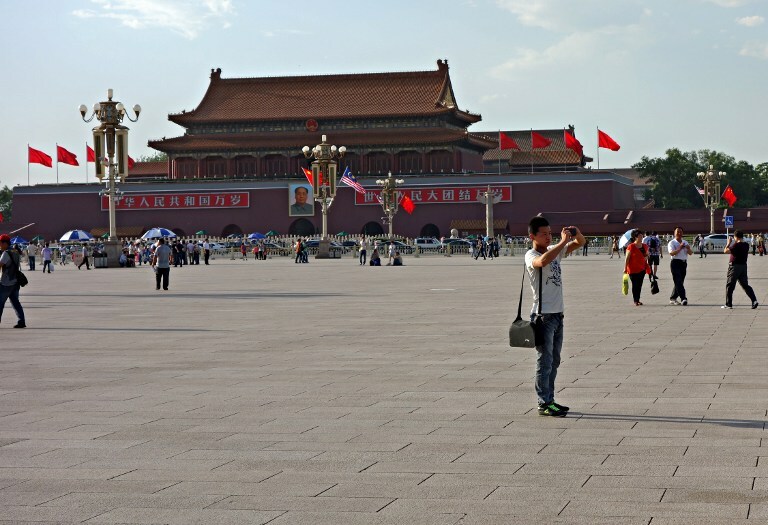 Meanwhile, authorities in the southwestern megacity of Chongqing are holding netizen Liu Wei under criminal detention on charges of "creating a disturbance" on May 17 after he traveled to Beijing in April and was photographed in Tiananmen Square. In 2011, Liu was handed a two-year labor camp sentence for tweets related to the largely theoretical "Jasmine Revolution" of 2009. A Beijing resident who declined to be named said the reports of 100,000 intelligence operatives had sparked a number of satirical comments on social media on Friday. "Everyone is laughing at the idea of these 100,000 intelligence operatives," he said. "Who knew that those people singing and dancing [in public places] and the people who come to call on the neighbors were all spooks?" "It's like going back to the old days," the resident said. Meanwhile, Beijing hit out at a proposal by U.S. lawmakers to rename the street outside China's Washington embassy in honor of jailed Nobel Peace Prize laureate Liu Xiaobo, in a public show of support for Chinese dissidents and rights activists. "Liu Xiaobo is a man who has violated Chinese laws, he has been convicted by the Chinese judicial authorities," Chinese foreign ministry spokesman Hong Lei told a regular news briefing in Beijing on Friday. Liu was sentenced to 11 years in prison in 2009 on a charge of "incitement to subversion of state power," based in part on his spearheading of Charter 08, a petition urging greater protection of human rights and democratic reforms in China. How much the communist government waste money on stopping people from remembering the dead? Couldn't they put that money into good use like education and healthcare? How long is the communist government planning to waste money on stopping this freedom? How long before Chinese citizens realize the communist government wasting to much money on these nonsense?